Bobby Jacoby and Arianna Richards wear red and pink high top Converse “Chuck Taylor” All Stars in the film. The townspeople of Perfection look at a piece of one of the giant worms. Tremors is a film about a group of people living in the isolated town of Perfection, Nevada, population 14, that is suddenly attacked by huge multi-headed carnivorous worms. The worms are first noticed by Valencino McKee (Kevin Bacon) and Earl Bar (Fred Ward), two jack-of-all-trades drifters who discover some very strange happenings in the area: a gobbled up herd of sheep, the head of a farmer, a station wagon buried in the sand, and a wino who has climbed a tree. They are attacked by the worms who have super sensitive hearing and the ability to move very quickly through the soil and sand. In the process of escaping, they run into Rhonda La Beck (Finn Carter) a seismology student who was in the area to study the unusual disturbances that were registering on her equipment. They hurry back to the town to warn the rest of the people about the threat. 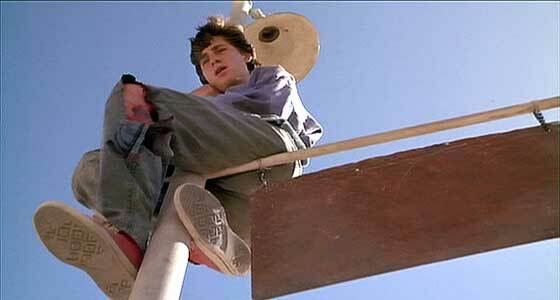 Melvin climbs up a lightpole to escape the attacking worm. People in the town are skeptical at first about what Val and Earl tell them, especially the town’s one teenager Melvin Plog (Bobby Jacoby) who makes fun of their report. But soon another sighting comes in from Burt and Heather Gummer (Michael Gross and Reba McEntire), two armed-to-the-teeth survivalists whose house is attacked by the worms. Burt and Heather barely escape the worms in a shoot-’em-up scene that would do any western or war picture proud, then flee to Perfection with some of their arsenal. There they join up with Val and Earl and help them warn the townspeople to evacuate. But it is too late. The worms arrive at the town and start attacking the general store and different houses in the small town. They soon are able to gnaw through the floors and walls, which sends the townspeople up to their rooftops in terror as they try to find places of safety. Eventually Val and Rhonda figure out that they are safe only on natural rock formations, where the worms can’t bore through. The remainder of the film is about how the townspeople learn to work together to escape from and destroy the worms. Nancy and Mindy climb onto the roof of their house when the worms start breaking through the floors. Although Tremors is described as a horror film, it really has the feel of a 1950’s science fiction piece like The Blob or The Attack of the Giant Leeches. PG-13 rated, it focuses more on how the townspeople of Perfection deal with the strange crisis that comes into their lives then the usual gore and dark looking special effects you would expect in a 90’s film. In fact, the majority of the film occurs in outside locations in the sunshine, so its action seems less threatening because it concentrates on the people, not the worms, which are mostly an unseen presence. Director Ron Underwood gives us a lot of action but still keeps the focus on the various responses of the people. Melvin the teenager at first thinks that the whole thing is a hoot, and enjoys scaring everyone with a false alarm when the townspeople are still evaluating the initial reports of Val and Earl. Walter Chang, (Victor Wong) the general store owner’s first reaction is to think that the worms could become a tourist attraction, naming them the “Graboids”. Nancy’s (Charlotte Stewart) reaction is to protect her daughter Mindy (Arianna Richards), and their fear seems genuine as they cower on the roof of their house. Val and Earl epitomize the typical reluctant heroes in the time of crisis, at first planning to run away but then later taking on leadership roles in saving the townspeople. Kevin Bacon and the rest of the cast are convincing in their roles as small town people suddenly forced to confront an unexpected terror. The bright tone of the film only adds to its surprisingly simple effectiveness as an ensemble piece. 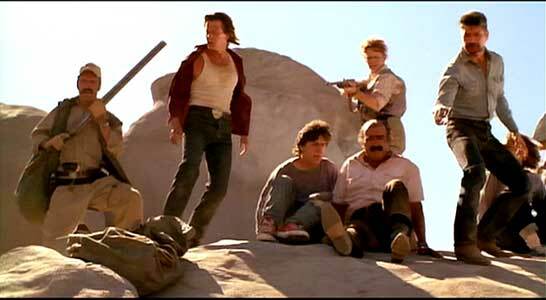 The townspeople flee to nearby rock formations to escape the voracious “Graboids”. Melvin hides out on a shed roof after the worms start attacking through the floors. 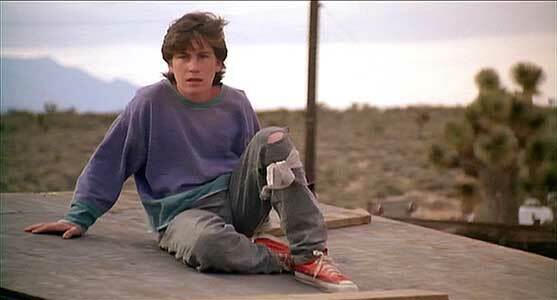 Bobby Jacoby, in his role as Melvin, and Arianna Richards, in her role as Mindy, wear high top chucks throughout Tremors. Bobby wears red high tops, and in his first appearance you see him playing basketball. Mindy wears pink high tops, which are handy for her when climbing up on the roof of her house. 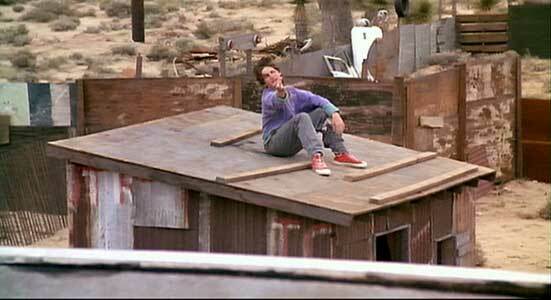 Probably the best chucks scene in the film is when a reluctant Bobby is chased up onto the rooftop of a shed because the worms have discovered how to bore through floors, and you see him there a little scared and a little defiant to the adults ordering him around while trying to figure out what to do. Melvin expresses his opinion when Earl suggests he would make a good decoy. Tremors. (1989) Kevin Bacon, Fred Ward, Bobby Jacoby, Michael Gross, Reba McEntire, Arianna Richards. Directed by Ron Underwood. Categories: Drama, Action/Adventure, Horror, Science Fiction/Fantasy.